The role of macrophytes in raising the pH of seawater on a local scale while also locally increasing levels of dissolved oxygen (DO) (McLeod et al., 2011; Nielsen et al., 2018) has been recognized in a suite of coastal marine ecosystems (Hofmann et al., 2011; Unsworth et al., 2012; Guadayol et al., 2014; Hendriks et al., 2014; Baumann et al., 2015; Kline et al., 2015; Sorte and Bracken, 2015; Kapsenberg and Hofmann, 2016; Kroeker et al., 2016; Kwiatkowski et al., 2016; Kapsenberg et al., 2017; Silbiger and Sorte, 2018). These mean differences, as well as the increased diurnal variation of both pH and DO in these submerged underwater vegetation (SUV) systems has been observed in seagrasses (Unsworth et al., 2012; Hendriks et al., 2014; Oreska et al., 2017; Nielsen et al., 2018; Pacella et al., 2018) and kelp forest environments (Delille et al., 2009; Frieder et al., 2012; Britton et al., 2016; Kapsenberg and Hofmann, 2016), raising the question of whether these habitats could become a refuge for climate change in the near future (McLeod et al., 2011). While some studies strive to investigate this link by mimicking environmental variation in the lab (Alenius and Munguia, 2012; Dufault et al., 2012; Cornwall et al., 2013; Kim et al., 2013; Comeau et al., 2014; Frieder et al., 2014; Gradoville et al., 2014; Roleda et al., 2015; Britton et al., 2016; Clark and Gobler, 2016; Davidson et al., 2016; Eriander et al., 2016; Keppel et al., 2016; Li et al., 2016; Small et al., 2016), only a handful of studies in marine systems have directly investigated the ecological or biological consequences for metazoan residents of these macrophyte-dominated habitats (Smith, 2016). In this study, we aimed to close this gap in knowledge by examining how seawater conditions in Southern California kelp forests could affect transgenerational plasticity (TGP) in a key calcifying grazer species. The physiochemical patterns in kelp forests along the California Current Large Marine Ecosystem (CCLME) have yielded observations that signal the significance of short spatial scales and temporal variation for this nearshore ecosystem (Frieder et al., 2012; Hofmann et al., 2013; Chan et al., 2017; Koweek et al., 2017). Particularly of note is the strong high-frequency covariation of pH and DO as multiple stressors in these nearshore environments (Frieder et al., 2012; Breitburg et al., 2015; Gunderson et al., 2016) that interact with a mosaic of coastal upwelling along the coastline (Chan et al., 2017). These patterns all suggest that adult organisms in the benthic environment, in particular, likely experience a range of pH as well as DO, and this gradient will vary in location and with proximity to macrophytes. Understanding such relationships will help to elucidate the future of these coastal oceans to complex environmental change (Gunderson et al., 2016; Vargas et al., 2017). From a biological perspective, these variations in the abiotic environment have the potential to alter resident biota in both direct and indirect pathways, while also altering ecological-evolutionary dynamics. In metazoans, the variable and coupled pH/oxygen environment can interact to alter a suite of biological performance metrics including behavioral and physiological processes (Todgham and Stillman, 2013; Frieder et al., 2014; Stillman and Armstrong, 2015; Gunderson et al., 2016; Cornwall et al., 2018). In addition, more complex processes such as TGP may play a defining role in shaping the eco-evolutionary trajectory of nearshore organisms to future environmental conditions (Marshall, 2008; Salinas and Munch, 2012; Munday et al., 2013; Hofmann, 2017; Chirgwin et al., 2018). Here, processes such as maternal effects and TGP have the potential to alter the environmental tolerances of organisms on observable timescales more relevant to the rapid rate of global change, even potentially facilitating evolutionary rescue through an acceleration in genetic evolution (Price et al., 2003; Marshall et al., 2016). In this study, we investigated the potential for a predominant form of TGP, maternal effects, to alter the performance of an ecologically important kelp forest grazer’s progeny (the purple sea urchin, Strongylocentrotus purpuratus, Pearse, 2006) in the presence or absence of a kelp forest environment in the CCLME. The purple sea urchin has long been acknowledged as a key species in driving community-level dynamics, notably by grazing down canopy-forming kelp and creating urchin barrens as an alternate stable state (Pearse, 2006; Filbee-Dexter and Scheibling, 2014). As an invertebrate with aragonite spicules and tests potentially vulnerable to undersaturated ocean conditions (Wilt, 2002), the fate of S. purpuratus to future ocean change has been heavily studied in an attempt to predict its impact on the future nearshore environment along its range (Stumpp et al., 2011; Yu et al., 2011; Kelly et al., 2013; Wong et al., 2018). Furthermore, previous studies have already shown that transgenerational effects on progeny traits can arise from adult acclimation to current-day upwelling conditions (Wong et al., 2018). Thus, we anticipate that TGP may be impacted during gametogenesis conducted in situ in the variable nearshore environment of the kelp forest. The principal objective of this study was to profile the pH and DO of the nearshore kelp forest environment, then to utilize S. purpuratus to investigate whether or not the presence or absence of this kelp forest environment would affect the quality of the offspring. We predict that the kelp forest may provide a more favorable environment for adult sea urchins, thus allowing for the generation of offspring more resilient and resistant to extremes of environmental conditions that could be created by natural processes (e.g., intense coastal upwelling or future ocean acidification). Sensor deployments and the urchin caging experiment were co-located at a study site on Mohawk Reef (MKO) near Santa Barbara, CA, United States (Figure 1). MKO is a shallow, rocky temperate reef defined by kelp beds of giant kelp (Macrocystis pyrifera); although varying with year and season, these beds typically extend 300 m along-shore and from 120 to 200 m cross-shore (Gaylord et al., 2007). MKO is also a permanent long-term research site for the Santa Barbara Coastal Long-Term Ecological Research (SBC LTER) group, where the mediation of kelp forest dynamics by abiotic factors such as water attenuation (Gaylord et al., 2007) and wave action (Reed et al., 2011) have been well-characterized. Figure 1. Map of the research site – Mohawk Reef (MKO). The inset (B) details the sites relative to the coastline in close proximity (130 m apart). The “inside” site is northwest (inshore) of the “outside” site. Isobaths are 100 m (A) or 10 m (B). The sensor deployments were located at one of two locations at MKO: the inshore site was situated inside of the kelp forest at a depth of 7 m (34.3941°N, 119.7296°W), while the offshore site was located outside of the kelp forest, in an area that completely lack kelp and had a sandy substrate at a depth of 11 m (34.3932°N, 119.7301°W). These two locations were <100 m apart, and will hereafter be referred to as the “inside” and “outside” locations, respectively (Figure 1). To understand the differences in daily changes of oxygen content inside and outside of the kelp forest environment, oxygen sensors (PME miniDOT®) were deployed at three different depths at each mooring: (1) just below the mean low tide on the buoy, (2) in the middle of the water column, and (3) 1 m off the bottom. Hereafter, these will be referred to as the “top,” “middle,” and “bottom” positions, respectively. Sensors were programmed to log every 10 min, and were deployed for 20 days (June 2–June 23, 2014). Sensors were retrieved and data were analyzed for patterns of oxygen dynamics as a function of depth and proximity to the kelp forest. To compare benthic relationships between pH, oxygen, and in situ temperature inside and outside of a kelp forest, SeapHOx® sensors (equipped with a Honeywell DuraFET® III pH electrode, an Aanderaa® 3835 oxygen optode, and Seabird® SBE-37 microCAT CTD) (Martz et al., 2010; McLaughlin et al., 2017) were deployed 1 m off the bottom at both the inside and outside spar buoy locations for 4 weeks (March 10–April 08, 2015). Sensors were programmed to log every 20 min. The relationship between pH and oxygen was modeled linearly following Frieder et al. (2012) due to the strong linearity of this theoretically non-linear relationship over the observed range. To ascertain the seasonal variation in the pH and oxygen dynamics in the kelp forest environment, an array of miniDOT® and SeapHOx® sensors were deployed at MKO from March 2016 to December 2016. Three miniDOT® sensors were placed inside of the kelp forest at the same three depths as in Deployment 1. Concurrently, one SeapHOx® sensor was placed 1 m off the bottom at the outside mooring, identical to the outside mooring site in Deployment 1. miniDOT® sensors were replaced approximately every 3 months, and SeapHOx® sensors were replaced approximately every 2 months. All sensors in deployment 3 were programmed to log every 20 min. Due to sensor failure, oxygen and temperature at the top of the water column at the inside mooring was not collected past August 03, 2016. Due to logistic constraints of deployment, pH, oxygen, and temperature at the bottom on the outside mooring was not collected past October 03, 2016. Sensors were deployed using established best practice techniques (Bresnahan et al., 2014; Kapsenberg and Hofmann, 2016; Rivest et al., 2016). Briefly, pH samples, coinciding with a sensor sampling timepoint, were collected during the sensor deployments using SCUBA to trigger GO-FLO sampling bottles (General Oceanics) underwater. These samples were immediately fixed with HgCl2 at 0.02% and stored at 15°C until analyzed using a spectrophotometric pH assay (unpurified m-Cresol, Sigma-Aldrich®, assayed in a Shimadzu UV-1800 spectrophotometer at 730 nm, 578 nm, and 434 nm at 25°C) and an open-cell endpoint titration for total alkalinity (certified 0.1M HCl 0.6M NaCl titrant, using a Mettler-Toledo T50 autotitrator calibrated with a certified Tris buffer at 35‰ NaCl and pH 7) (Dickson et al., 2007). Total alkalinity was calculated from raw autotitrator electrode values using the R package seacarb (Gattuso et al., 2017), which was subsequently used to calculate pH for in situ conditions. These pH calibration samples were then used to calibrate the data using seacarb. For oxygen measurements, multiple sensors were placed in the same flow-through sea table tanks to ensure precision before and after each deployment, and Winkler titrations were conducted to ensure accuracy after each deployment (Wetzel and Likens, 1991). Oxygen concentration was calculated from oxygen saturation using relationships from Weiss (1970) (R package marelac v.2.1.6) using salinity values from the long-term mooring time series maintained in the SBC LTER program’s database (Washburn, 2018). Adult sea urchins were collected from the kelp forest at MKO (under California Department of Fish and Wildlife Scientific Collecting permit #SC-1223) in August 2017. To ensure that the bulk of sea urchin gametogenesis occurred during the caged outplants, urchins were pre-spawned before outplants with an electric current (9 V DC for three 5-s shocks, Professor Kathy Foltz, UC Santa Barbara, personal communication). Shock spawning was preferred for this step, as it is a less invasive process than the KCl injection typically used for urchin spawning (Gago and Luís, 2011). Urchin cages were constructed out of 1-inch PVC-coated welded wire fencing shaped into cylinders 50 cm in length and 30 cm in diameter. For this field experiment, 6 outplant cages were deployed using SCUBA: (1) three replicate cages were placed inside the kelp forest on the benthos, anchored to weights in ∼7 m of water, and (2) three cages were placed outside of the kelp forest on the benthos, attached to both weights and a 1 m sand anchor in ∼11 m of water. To begin the acclimatization period, each of the six cages was loaded with 10 adult sea urchins on August 27, 2017. Cages were revisited by SCUBA every 2 weeks and urchins were fed liberally with giant kelp, Macrocystis pyrifera, collected at MKO. Urchins were retrieved from the cages on November 14, 2017 after 79 days of acclimatization at MKO and brought back to laboratory seawater facilities at UC Santa Barbara for egg collection and the embryo culturing experiment. Each set of cages was paired with a miniDOT® oxygen sensor, which was programmed to collect oxygen data throughout the deployment period at 10-min intervals. During this period, one sensor deployed for this experiment failed (on the outside mooring). As a result, the data presented here were collected by an identical miniDOT® sensor deployed 1 m away (Washburn, 2018), a part of the SBC LTER sensor array at MKO. After 79 days of conditioning in the cages, adult urchins were collected on November 14, returned to the lab, and spawned within 24 h. Spawning was induced via injection of 1.0M KCl with intermittent shaking. For the fertilization step, eggs from five females from each maternal exposure treatment (inside vs. outside the kelp forest) were crossed with sperm from one male urchin from the same treatment. Care was taken to ensure that an identical number of eggs contributed from each female was represented in the pooled egg population. At this time, prior to fertilization, samples of eggs (n = 1,000 in three cryovials) were also collected for further analysis; these samples were flash frozen in liquid nitrogen and stored at -80°C prior to analyses. These eggs are designated as “I” or “O” for “Inside” and “Outside,” corresponding to the location of the adults during conditioning in the field. In addition to these samples, egg yield from every spawned female was recorded as an estimate of fecundity. Test diameter was also measured to the nearest millimeter for all females. For culturing, embryos were raised at 15°C using pCO2 conditions chosen to reflect present-day relaxed and upwelling (Feely et al., 2008) conditions (400 μatm pCO2 and 1000 μatm pCO2, respectively). Gases of these CO2 partial pressures were first created using mass-flow controllers (Sierra Manufacturing, SmartTrak 101 and 100L); they were then equilibrated in seawater using venturi injectors in 20L header tanks. Seawater from the header tanks was pumped to flow-through culturing tanks through irrigation drippers (Fangue et al., 2010). For each treatment, one header tank supplied three replicate flow-through culturing tanks in a pseudoreplicate design. To calculate pCO2 values, the carbonate system was parameterized by measuring spectrophotometric pH and total alkalinity titration as described earlier for sensor calibration samples, with the exception that the pH samples were not fixed with HgCl2 and instead were analyzed immediately. These culturing conditions created in the laboratory setting are labeled “L” and “H” for “Low” and “High,” and the crossed maternal conditioning and embryo treatments were named with a combination of these two codes: e.g., “IL” indicates embryos spawned from parents conditioned inside of the kelp forest, were then raised in a low-pCO2 environment. To assess the consequences of differential maternal environments on egg quality, three metrics were measured in collected eggs: (1) average egg length over three different axes (n = 30 per mother), (2) egg area (n = 30 per mother), and (3) total protein content (n = 3 tubes of 1,000 eggs per female). In addition, two measures were taken for each adult female urchin: (1) total number of eggs spawned after KCl injection, and (2) test diameter. Furthermore, to assess the impact of maternal conditioning on embryo traits and development, three metrics of hatched blastula embryos were measured: (1) embryo length over the major axis (n = 30 per replicate culture vessel), (2) embryo area (n = 30 per replicate culture vessel), and (3) embryo total protein content (n = 3 tubes of 1,000 embryos per replicate culture vessel). Eggs collected from the conditioned S. purpuratus females were preserved in 2% formalin in seawater, and imaged using a trinocular compound light microscope (Olympus BX50) equipped with a digital camera (Lumenera Infinity Lite), along with a computer running the associated imaging software (Infinity Capture v. 6.2.0). All samples were imaged within 30 days of the spawning event which occurred on November 15, 2017 and 40 images were captured for each egg sample. Using these images for morphometric analysis, 30 eggs were measured from each female using ImageJ software (Schneider et al., 2012). In addition, 30 hatched blastula embryos were measured from each replicate embryo culturing vessel. For eggs, both average diameter and two-dimensional area were measured. As hatched blastula embryos are more ellipsoidal, the major axis (longest diameter that intersects the center) was chosen as a representative diameter. Two-dimensional area was also measured for these embryos (Supplementary Figure 1). Three replicate tubes of 1,000 eggs were collected from each female for determination of total protein content. The tubes were gently centrifuged to pellet the eggs, excess seawater was removed, and the sample was then frozen in liquid nitrogen prior to storage at -80°C until use in further analysis. Three replicate tubes of 1,000 embryos were collected from each replicate embryo culturing vessel and preserved as described above for the eggs. Embryos and eggs were processed using methods adapted from Prowse et al. (2007) and Byrne et al. (2008). Briefly, samples were re-suspended and sonicated in a lysis buffer (20 mM Tris-HCl, 130 mM NaCl, 5 mM EDTA, 1% Triton X-100, 1% Sigma-Aldrich Protease Inhibitor Cocktail, pH 7.6). The resulting homogenates were used in the BCA protein assay within 72 h of extraction. Protein content assays were performed using a microplate BCA protein assay (Catalog number 23225, Pierce Biotechnology) according to the manufacturer’s instructions. All statistics and analysis were conducted using the R statistical software, as well as the R Studio IDE (RStudio Team, 2017). All power spectral density (PSD) estimates were conducted with five overlapping Hanning windows (50%) for 10 degrees of freedom (R package signal, v. 0.7–6) with 95% confidence intervals calculated from an inverse chi-square distribution. Beta statistics (β), or “environmental color” for time series were calculated monthly for DO values collected by each sensor for Deployment 3. After removing the diurnal signal using a moving average filter, β was calculated as the negative slope of the log10 – log10 spectral density plot (Marshall and Burgess, 2015), with larger values of β indicating that the variance of the signal was more biased toward lower frequencies. β was either calculated for the entire deployment (in the case of Deployments 1 and 2), weekly (in the case of Deployment 3), or monthly (in the case of the deployment paired with sea urchin outplants). Wind data were taken from NOAA NBDC buoy #46054, which was the closest operational buoy for the duration of the field experiment1, while current data were collected by the SBC LTER (Washburn, 2018) and averaged across all depths. Current data were rotated into principal axes (u = onshore positive, v = poleward positive), and wind stress was calculated from wind velocity (Large and Pond, 1981). Morphometric analysis, as well as biochemical analysis, were combined and visualized in tandem using a principal components analysis (PCA), and groupings were tested using a PERMANOVA. In general, levels of DO were significantly different inside and outside the kelp forest, as well as at each depth (Figure 2). This difference with depth was observed at both sites. Specifically, mean values for oxygen were significantly different for each sensor [repeated-measures ANOVA for time of day, F(17725,5) = 1789.5, p < 0.0001; calculated with Satterthwaite approximation of degrees of freedom; all pairwise comparisons significant]. The sites inside of the kelp forest also exhibited a higher diurnal cycle of DO than those outside, with the top of the water column exhibiting the highest degree of diurnal variation, followed by the middle and bottom of the water column (Figure 2D). The differences in the β predictability index for each of these sites was significantly different (Figure 2C), with β being lower outside of the kelp forest, as well as in the middle of the water column. Figure 2. Dissolved oxygen regimes at MKO for Deployment 1 (June 2 – June 23, 2014), where six oxygen sensors were deployed (two locations and three depths) inside and outside of the kelp forest. (A) Boxplots of the oxygen values, taken every 10 min. (B) Mean daily swings of oxygen. (C) β indexes calculated for the entirety of the deployment, after subtracting the diurnal signal. (D) Power spectra of the deployment for each sensor. All three positions in the water column also exhibited a significantly different diurnal pattern (sinusoidal fit, p < 0.0001 for both vertical position and mooring location), and these differences were also apparent in the PSD (Figure 2D). Overall, the combined significant differences in means and variation of these parameters highlighted a different oxygen regime for each of these sites and water column depths (Figure 2B). Here, we observed significantly different DO and pH at benthic sites inside and outside of the kelp forest environment. 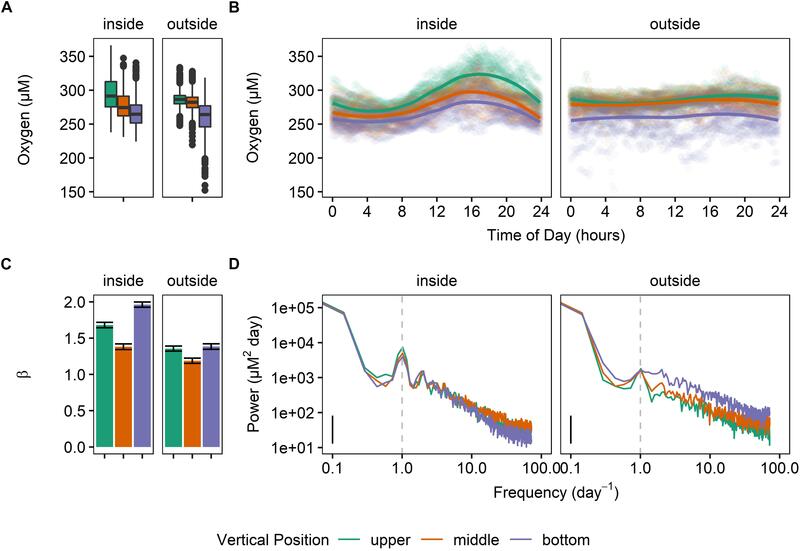 Specifically, the benthic site inside of the kelp forest exhibited stronger diurnal variation of DO as compared to the outside, similarly to what was observed in Sensor Deployment 1. Examining the relationship between pH and DO yielded a tight correlation (r2 = 0.9313, Supplementary Figure 2). The slope of this relationship was not significantly different between the two benthic sites [ANCOVA, F(4166,1) = 1.727, p = 0.1889]. While the lines fit separately for the sensors exhibited a different intercept [F(4166,1) = 145.026, p < 0.001], the discrepancy in the intercept was 0.01 pH units – within the margin of error of our spectrophotometric measurements, given an impure m-Cresol dye and operator error (Kapsenberg et al., 2015). Thus, data from both sites were used to fit the model correlating oxygen and pH in the nearshore environment, with a resulting relationship of pHtotal = 0.001718([O2]) + 7.519, with [O2] expressed in μM. The power at the diurnal frequency (one cycle per day) was stronger inside of the kelp forest for DO, pH, and temperature (Figure 3), though not significantly. 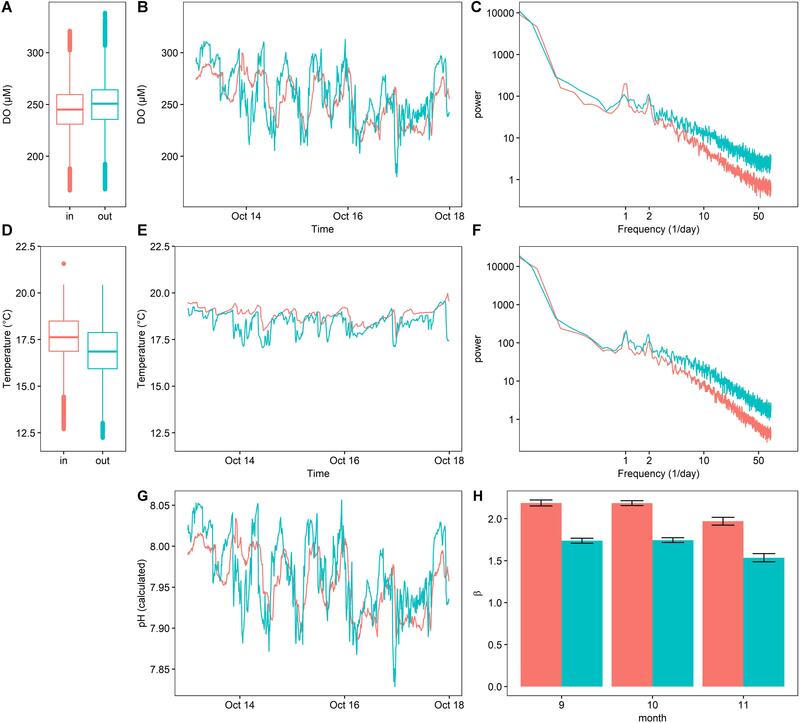 Notably, the benthic site inside of the kelp forest exhibited a slightly stronger (Figure 3C) diurnal cycle for both DO and pH, while the outside benthic site exhibited more high-frequency noise throughout this deployment. While oxygen and pH were slightly higher outside of the kelp forest on average, temperature was slightly lower (Figure 3A). There was also a significant increase in diurnal signal of pH and oxygen, as well as a decrease in the absolute values of pH, oxygen, and temperature, at the end of the deployment on April 6 (Figure 3B). This latter event also coincided with a change in wind stress (Figure 3D). Figure 3. Deployment 2 (March 10 – April 08, 2015) at MKO. (A) Boxplot of measured values for each sensor. (B) A 10-day representative sample of oxygen, temperature, and calculated pH data taken 1 m off the bottom, inside and outside of the kelp forest. (C) PSD of the entire deployment, for temperature and oxygen, (D) measurement of wind stress at the site, taken from NOAA NBDC #46054. (E)β indexes calculated for the entirety of the deployment, after subtracting the diurnal signal. At MKO, oxygen varied greatly with season with a 79 μM difference in monthly averages between July and November 2016 at the benthic site inside of the kelp forest. Specifically, DO peaked at 469 μM and declined to 125 μM over the course of the 6-month deployment (lowest and highest 10 values averaged). Using the linear equation derived from Deployment 2 (Supplementary Figure 2), this corresponded to a pH range of 8.32–7.73. This lowest extreme of pH and DO was observed outside of the kelp forest with a single SeapHOx® sensor (Figure 4), which captured a strong acidification event during March 2016 that was tied to a wind relaxation causing a strong poleward current. Figure 4. pH, oxygen, and temperature outside of the kelp forest on the benthos at MKO during an extreme upwelling event for Deployment 3 (March–May 2016 shown). Also shown is ADCP data from the same site, rotated into principal components, and wind stress calculated from NOAA NBDC #46054. Daily averages of oxygen, temperature, and pH (Supplementary Table 1 and Figure 5) depicted a seasonally dynamic kelp forest environment, with seasonal upwelling (e.g., early April) as well as periods of comparatively static conditions (September onward, Figure 6). This strong seasonal variation was observed in tandem with the fine-scale variation between sites seen in Deployments 1 and 2 (Figure 2 and Supplementary Figure 2); that is, a significantly higher absolute DO content inside of the kelp forest, but accompanied by relatively high diurnal variation. This diurnal variation varied by depth and season, peaking in the early summer (Figure 6). When examining diel patterns, daily variation in DO peaked on days in early summer, in concert with the maximum daily variation of pH, minimum mean pH, and maximum mean DO, but it was offset from the seasonality of temperature variation, which occurs in late summer to early fall (Figure 6). These data support the fact that the changes in pH and DO were largely not thermodynamically driven due to this temporal decoupling of maximum diel variation between temperature and DO/pH. Comparing the power spectra of two contrasting months (March vs. July) showed a pronounced difference in both the average diurnal peak in the signals, as well as a separation between the signals (Supplementary Figure 3), with the outside-bottom sensor displaying a significantly lower diurnal signal in the summer when the kelp forest is exhibiting the highest amount of productivity. Figure 5. Daily averages of oxygen, pH, and temperature at various sensors for Deployment 3 (March – December 2016). Figure 6. Monthly means (A), mean daily swings (B) and predictability indexes (C) for Deployment 3 (March – December 2016). 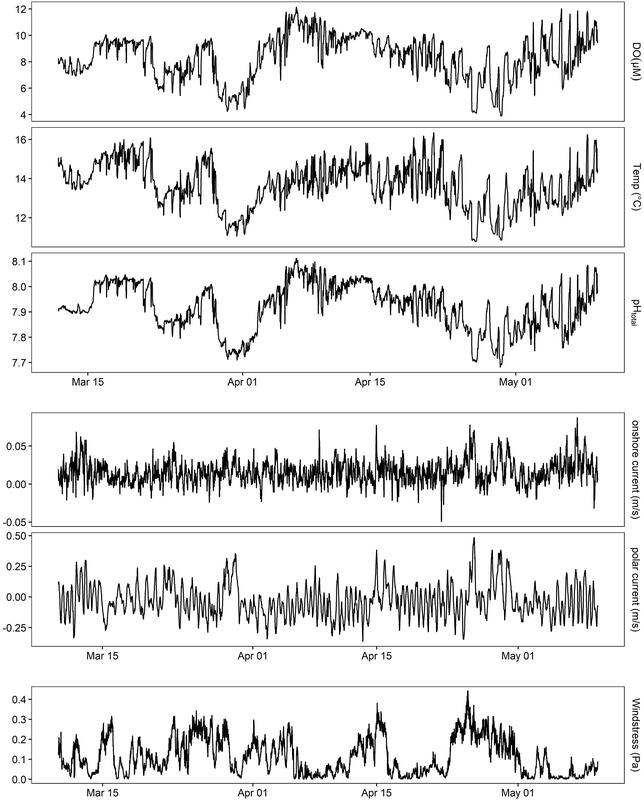 After removing this diurnal signal from the time series larger β values were found in the benthos inside of the kelp forest when compared to outside the kelp forest (Figure 6C), indicating that the background variance was more predictable over time (i.e., shifted predominantly to lower frequencies) inside of the kelp forest compared to outside of the kelp forest. 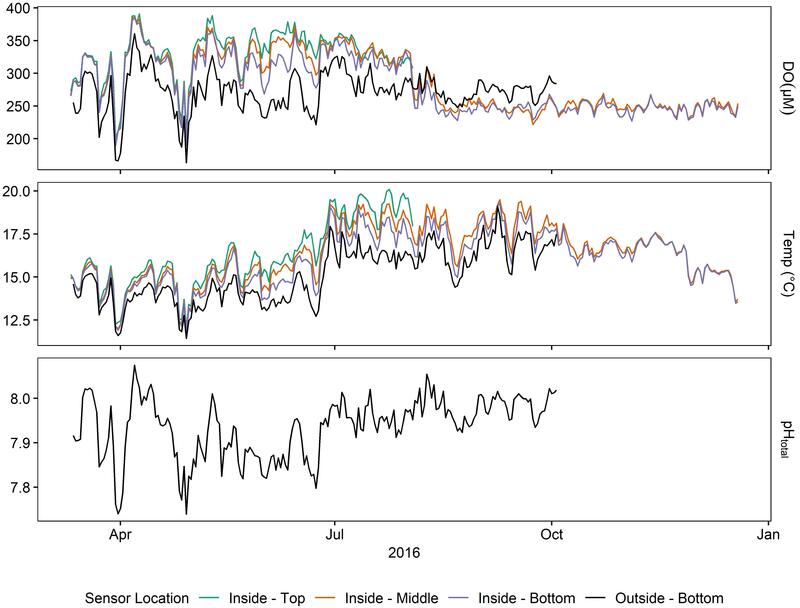 In general, the oxygen and temperature regimes at the two study sites – inside and outside the kelp bed – (Figure 7) mirrored those observed during Deployment 3 in the previous year. This pattern was characterized by significantly different DO regimes as a function of the proximity to kelp, particularly in the frequency domain (Figure 7C). Figure 7. Dissolved oxygen (A–C), temperature (D–F), and calculated pH (G) inside (red) and outside (blue) of a kelp forest environment, expressed as boxplots for the entire outplant (A,D), a representative 5-day timeseries (C,F), power spectra (C,F), as well as calculated β indexes (H) (±SE). While oxygen content varied significantly between the two sites [repeated-measures ANOVA, F(10195,1) = 505.04, p < 0.0001], the mean difference in DO between these sites was small (245.94 ± 23.7 μM inside of the kelp forest, 250.41 ± 25.38 μM outside of the kelp forest, mean ±SD) (Figure 7A). Additionally, DO inside the kelp forest varied more strongly in the diurnal frequency peak, but less so at high frequencies. In contrast, the DO outside of the kelp forest environment was characterized by a lower diurnal variation, as well as more high-frequency variation. This pattern can be visually observed in the time series data (Figure 7B), where the DO inside of the kelp forest exhibited a more consistent sinusoidal pattern, while the DO outside of the kelp forest exhibited a more stochastic signal indicative of high-frequency variability. This was quantified through the environmental color statistic (Figure 7H), where higher values of β inside of the kelp forest indicate a higher bias toward lower-frequency environmental noise and thus a more predictable variation over time. Temperature also varied in both harmonic content and absolute value. In absolute terms, temperature varied significantly between the two sites [repeated-measures ANOVA, F(10050,1) = 7032, p < 0.0001], with the means differing by 0.6°C (17.60 ± 1.28°C inside of the kelp forest, 16.83 ± 1.42°C outside the kelp forest, mean ±SD) (Figure 7D). In the frequency spectrum, similar to the DO data, temperature exhibited high-frequency variability outside of the kelp forest in comparison to inside (Figure 7F). This degree of variation can be visualized as high-frequency noise in the representative time series data (Figure 7E). In contrast to DO, however, the diel variation of temperature inside the kelp forest was not notably different than that outside the kelp forest (Figure 7F). In terms of egg characteristics, the data showed that some morphometric characteristics of eggs covaried strongly regardless of maternal exposure; these were egg area and egg diameter (Supplementary Figure 4, linear regression p < 0.0001, r2 = 0.96). Although we expect a square relationship between length and area if the shapes of the eggs were all identical, this relationship was fairly linear over the observed range of both metrics. In order to further explore this variation, these three measured metrics (egg diameter, egg area, and egg protein content) were combined and transformed using a PCA, the first two components of which are reported here (Figure 8A). With the PCA technique, correlates (e.g., egg diameter and egg area) can be accounted for and collapsed onto a primary axis. Here, eggs from females conditioned inside the kelp forest had higher total protein content, but were fewer in number (PERMANOVA, p = 0.01), while in contrast, eggs from females conditioned outside of the kelp forest were larger in number but less rich in protein (Figure 8A). Figure 8. PCA of measurements at the (A) egg level (egg average protein, egg area, egg diameter), averaged to match measurements at the individual female level (egg count, test diameter); PCA of measurements taken of (B) hatched blastula embryos (17 hpf). OH was significantly different from the other treatments (FDR post hoc test). Absolute values can be found in Supplementary Table 2. During the culturing run of 17 h, pCO2 levels in the culturing vessels remained consistent to target values for each of the two treatments (target values = 400 μatm and 1,000 μatm, actual values = 413.59 ± 2.40 μatm pCO2 and 987.59 ± 31.38 μatm pCO2 – respectively). For these determinations, carbonate parameters were calculated based on alkalinity and salinity values taken on the second day of culturing (2,214.80 μmol kg-1 and 33.4‰, respectively). These collected embryo data were visualized by PCA. Here, because two of the variables (protein content and embryo area) were orthogonal and corresponded well with PC1 and PC2, these original variables were used in analysis in lieu of the principal components. Overall, there was a detectable effect of maternal conditioning in this study (Figure 8B). Embryos from females that performed gametogenesis outside the kelp, and then were raised under high pCO2 conditions (abbreviated OH), had a larger body size than the other three treatments (IL and IH, or the offspring of mothers caged inside of the kelp forest and raised at either low or high pCO2, and OL, the offspring of mothers caged outside the kelp forest and raised under low pCO2). This was quantified as a significant effect of embryo area between treatments [F(3,26) = 11.156, p < 0.001]. In addition, a post hoc test revealed a significant difference in the area of OH embryos compared to that of other treatments (FDR, q = 0.05). Lastly, there was a nearly significant effect of embryo protein content [F(3,8) = 2.81, p = 0.11]. However, no significant pairwise comparisons were found with a post hoc test for false discovery rate (FDR; Benjamini and Hochberg, 1995). The overall goal of this study was to characterize spatiotemporal variability of pH and DO in and around kelp forests at a range of timescales, from daily to seasonal, while comparing sites inside and outside of a kelp forest environment – then, to investigate the biological impacts of the spatiotemporal variability of physiochemical conditions around kelp forests. We found that the kelp forest environment provided a generally higher pH, higher DO environment throughout the water column, while also introducing a more predictable diel signal and diminishing high-frequency variation. These differences in physiochemical conditions provided by the kelp forest appeared to impact characteristics of both the sea urchin eggs and early stage embryos, indicating that urchins develop more favorably and are more resistant to impacts of environmental variability when raised in environmental conditions that mimic that of a kelp forest. In general, we found significantly different regimes of oxygen and pH during this series of sensor deployments at MKO. The salient findings are: (1) DO and pH covaried strongly in the kelp forest environment, and both parameters can decrease to levels that could potentially affect organismal physiology, (2) pH and DO varied seasonally, both in daily means and in diel variation, and (3) this diel variation, as well as high-frequency variation, was significantly different inside and outside of the kelp forest. Overall, the patterns of DO and pH captured by this series of sensor deployments may have both biological and ecological consequences for marine biota in this nearshore environment (Breitburg et al., 2018). While the most consistent trend throughout the deployments was the strong covariation of oxygen and pH (Supplementary Figure 2), the DO values observed in Deployment 3 included values down to 125 μM (3.9 mg/L) with 64 μM (2 mg/L) being the threshold for hypoxia for many species (Vaquer-Sunyer and Duarte, 2008). These low values were observed in March through May and were not observed in months with the highest daily variation (Figure 5). Such episodic, event-scale variations appear to be linked to the shoaling of upwelled water, as they are also coupled with low temperature (Figures 2, 5). The most notable low pH event occurred in late March (Figure 4), and showed a regime of drastically decreased temperature, pH, and oxygen occurring simultaneously for several days. This was paired with a decrease in wind stress and a subsequent poleward flow of water. In contrast, the low, but more variable event on April 30 was accompanied by increased wind stress and a net onshore flow, which more likely indicates an upwelling event. Contextually, given that global ocean pH is expected to decrease ∼0.2 units in the next 100 years (Feely et al., 2009), these dips pH (-0.3) in this time series are likely to play a large part in the future of this coastal marine system (Gruber et al., 2012; Hofmann et al., 2013; Chan et al., 2017). Although a DO value of 2 mg/L (or 64 μM), has long been used as a hypoxic threshold in the context of fisheries, this perspective has been re-visited with researchers noting that this concentration can be a drastic underestimation of sublethal and lethal thresholds of hypoxia when looking across taxa (Vaquer-Sunyer and Duarte, 2008). Here, marine fish and crustaceans have been noted to be the most vulnerable to hypoxia, and 4.6 mg/L (or 147 μM) is suggested as a precautionary 90-percentile value of survival, especially given that the ecosystem-level response to hypoxia is unpredictable and has been poorly studied (Steckbauer et al., 2011). In this time series, a value this low was seen most notably for 11 out of 22 h on April 30, and for over 12 continuous hours on April 26 (Figure 4). In addition, considering that these decreases in levels of DO are strongly linked to decreases in pH, the multiple stressor scenario of ocean acidification and hypoxia demands a more conservative cutoff for hypoxia (Gobler and Baumann, 2016) given that the interaction between these stressors is hard to predict and can differ even amongst closely related taxa (Crain et al., 2008; Przeslawski et al., 2015). For instance, in studies on red abalone in Monterey Bay (Kim et al., 2013), juveniles showed adverse effects when subjected to low pH (7.5) and low oxygen (5 mg L-1), and the investigators attributed the majority of mortality to the hypoxia. This oxygen value was seen at MKO for 18 out of 62 h in early April, then again for 31 out of 80 h in late April 2016 (Figure 4). Overall, our data from the kelp forest indicate that resident taxa would encounter physiologically challenging conditions on a regular basis, even within taxa that are traditionally thought to be resilient to ocean change (Vaquer-Sunyer and Duarte, 2008). Lastly, independent of these event-scale changes, DO values decreased with depth in the water column, and also decreased outside of the kelp forest along with pH (Figures 2, 5). In general, pH and DO were very highly correlated in our study (Supplementary Figure 2). This strong coupling of these two factors has been previously observed, most recently in Frieder et al. (2012) which found a similar relationship except for a slightly different slope and an intercept difference with our margin of spectrophotometric pH error. The data collected in this study showed a seasonal variation of pH and DO in a kelp forest environment, as has been reported in other studies in California Macrocystis forests (Kapsenberg and Hofmann, 2016; Koweek et al., 2017). At MKO, seasonal variation was driven by both event-scale variation, as described above and displayed in Figure 4, and diurnal variation, as described below and displayed in Figure 6. In particular, the diurnal variation varied strongly with season, peaking in early summer. This was slightly earlier than the peak that was observed previously by Kapsenberg and Hofmann (2016), data that were collected in 2012–2015 at Anacapa Landing Cove, a site in the Santa Barbara Channel positioned on Anacapa Island further out in the Channel. In addition, seasonal variation of diel pH cycles was also generally higher than observed at the Channel Islands site in Kapsenberg and Hofmann (2016). Kapsenberg and Hofmann also observed very little change inter-annually in seasonal pH and oxygen. However, given that the sites on the Northern coast of the Channel Islands experience little wind-driven upwelling, more variable interannual conditions could be expected on the mainland where abiotic conditions have a larger effect. To date, no other kelp forest sites have been instrumented to observe seasonal trends. It is becoming increasingly clear that organismal exposure to pH and hypoxia cannot be completely encapsulated by discussing means and extremes, but that frequency of variation can play a strong factor (Cornwall et al., 2013). As expected, we found that pH and oxygen varied dramatically in this coastal system at MKO. The largest daily ranges of pH and DO were observed at middle and bottom of the kelp forest (Figure 6). One of the large drivers of this change in daily range was at a diel frequency, and corresponded to expected (but not measured) patterns of photosynthesis and respiration that would track availability of light in the water column. In all power spectra analyzed, the diurnal signal was the dominant periodic function, mirroring results from previous studies in the Southern California Bight (Frieder et al., 2012). Here, both mean DO and diel variation of DO decreased with depth in the water column (i.e., away from the kelp canopy), and decreased outside of the kelp forest (i.e., away from the kelp bed itself). In addition to differences in diel variation, differences in high-frequency variation were observed both vertically in the water column as well as between sites. High-frequency variation of DO and temperature were observed on the benthos outside of the kelp forest (Figure 2). Thus, it appears that kelp forests offer an environment with a strong diel variation of DO and pH, but less high-frequency noise. This pattern is possibly caused by the dampening of water flow around kelp forests, which has been classified at this site in past studies (Gaylord et al., 2007). This change in physical flow likely contributes to the cleaner and stronger diurnal signal recorded inside of the kelp forest. The deeper, outside site could also be subject to different oceanographic processes, such as internal waves. This study compared a site inside of a kelp forest to one directly offshore, a site that lacked kelp and was characterized by sandy substrate. These sites were chosen as Frieder et al. (2012) observed higher gradients cross-shore compared to alongshore, and thus we expected to see a larger variation along this axis. With alongshore currents drastically stronger than cross-shore currents, it is intuitive that the physiochemical gradients would be stronger heading offshore. Although Koweek et al. (2017) noted that depth was as great of an indicator of seawater chemistry change as horizontal distance, Frieder et al. (2012) observed that depth was a larger determinant of spatial pH difference than distance. Our study neither refutes nor supports these results, as the two sites were at different depths (7 m and 11 m). Choosing sites that were both different in depth and in kelp presence was intentional, as the main purpose of this study was to investigate the effect of the kelp forest on benthic communities. Regardless, we found a larger difference between the two sensors at the benthos than between the two sensors at the top and bottom of the water column (Figure 2). In comparing the three available datasets on California kelp forests, differences in these systems are likely due to site-by-site differences, as well as sampling methodology. Koweek et al. (2017) sampled the water column from 9:00 to 12:00 local time, a time of day when vertical stratification of DO was the highest in the MKO deployments (Figure 2). It is likely that this sampling thus captured the vertical stratification of the kelp forest at its strongest point, which may partially explain why the study found large differences in water chemistry with depth. While Frieder et al. (2012) used autonomous pH sensors instead of the discrete sampling used by Koweek et al. (2017), most of their La Jolla kelp forest deployments were conducted in an area of the kelp forest at a 20 m depth. A larger effect of depth in these La Jolla kelp forests is not surprising as this is far beyond the extent of Macrocystis beds in the Santa Barbara Channel. In summary, these results highlight the significance of kelp forests in mediating the pH and DO of the water column through the seasons. While these data help us understand another way that Macrocystis acts as a foundation species, one side note of importance is the consideration of the fate of giant kelp itself under future ocean conditions. To date, few studies have investigated the effect of future ocean conditions on Macrocystis physiology, and generally find no effect or a positive effect (Roleda et al., 2012; Leal et al., 2017). While kelp forests in the Santa Barbara Channel appear to be relatively resilient to extreme warming events (Reed et al., 2016), temperature is generally considered a limiting factor for kelp forest ranges (Wernberg et al., 2019) and kelp forests are generally declining globally (Krumhansl et al., 2016). Regardless, better understanding of the impact of kelp forests on the surrounding water column, as well as its surrounding “sphere of influence,” will be a critical piece in predicting the fate of nearshore communities to future environmental change. In support of this aspect of the study, we discerned that the presence of macrophytes was likely a large driving factor of DO and temperature variation at the study site. Biologically, we found that (1) sea urchin gametogenesis was affected in situ by these seawater conditions, and (2) this environmental variation also affected traits of the embryos raised using gametes from adult sea urchins conditioned at sites inside vs. outside the kelp forest. Overall, these results suggest that macrophytes may play a key role in the fate of sea urchins during a critical stage in their life history, potentially leading to ecosystem-level effects in the nearshore environment in the near future. At the two field sites, adult sea urchins were exposed to different regimes of DO and temperature. 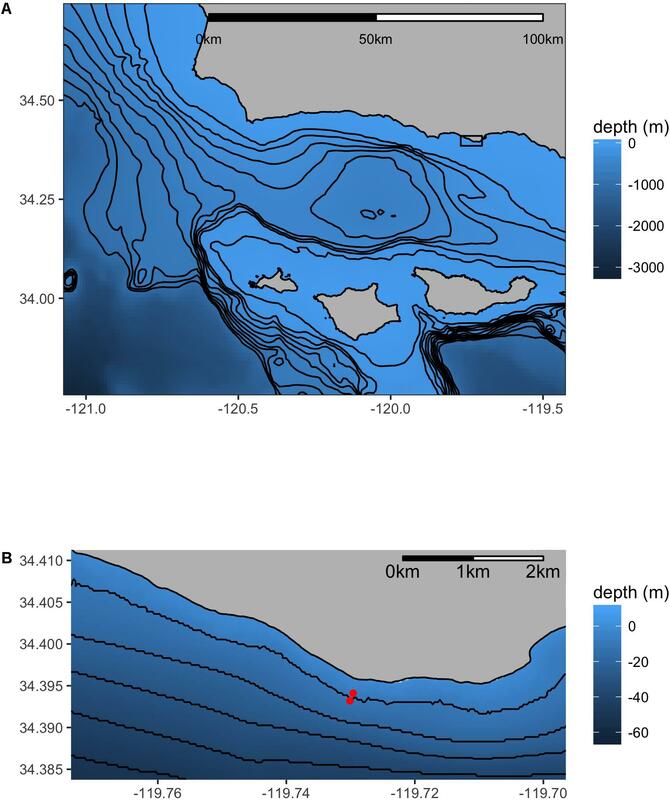 This differential experience in situ included not only a higher temperature and DO inside of the kelp forest, but also a noticeable difference in the frequency of variability between these two sites (Figure 7). Although pH was not directly measured during the urchin caging experiment, given the strong coupling between pH and DO (Supplementary Figure 2), we calculated approximate pH exposure for the deployment (Figure 7). One prominent difference is the color of the noise floor β (Figure 7H), which indicates that the kelp forest environment provided a more predictively variable environment during sea urchin gametogenesis. It is broadly understood that organisms exhibit physiological tolerances that reflect the abiotic variability in their environment, a process that could potentially play a large role in responding to anthropogenic environmental change (Sunday et al., 2011). However, it is less clear how this response to abiotic variation in nature could interact with TGP (Donelson et al., 2018). The results of this study begin to examine how the environment alters performance of the progeny via TGP, and further is a direct test of how this form of eco-evolutionary dynamic might play out in nature. In our comparison of kelp-rich vs. kelp-poor study sites, we observed that females conditioned outside of the kelp forest produced more gametes, but the eggs had a lower protein content. In comparison, females conditioned inside of the kelp forest spawned fewer gametes that were more protein-rich. Although subtle, the data hint at a possible tradeoff in maternal provisioning in response to the environmental variability encountered during gametogenesis. While some models and systems predict that adverse environments can be optimized for by generating fewer, larger eggs (Olofsson et al., 2009), other empirical studies posit that fitness can be maximized in harsh, unpredictable environments by creating many eggs with fewer resources, noting that resource-dependent fitness may not play a large role in more variable, unpredictable environments. From a larval ecology perspective, S. purpuratus have planktotrophic larvae that derive a relatively small amount of their larval energy needs through maternal provisioning compared to direct developers and non-feeding larvae (Marshall and Keough, 2007). Because S. purpuratus early stages do not begin feeding until later in development (as pluteus at ∼72 hpf, Strathmann, 1987), enhanced energy storage or maternal provisioning may play a significant role in the critical early life stages of this organism. 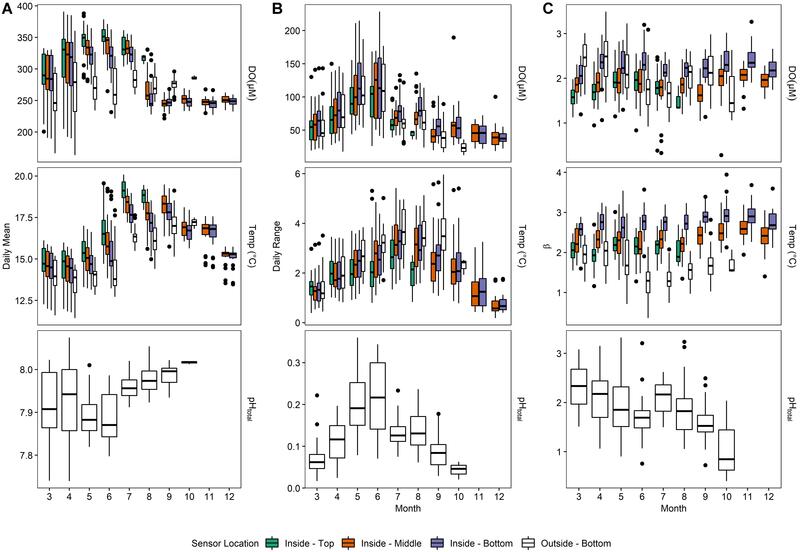 Lastly, while colder temperatures have been linked to larger optimal egg volume across taxa (Levitan, 2000; Pettersen et al., 2019), we did not see a significant difference in egg size as a function of parental conditioning. It appears that the tradeoff between protein content and egg number may play a larger role in larval success compared to egg size in this current study. While there was a negative correlation between egg size and protein content at the egg stage, there were no significant differences in protein between the maternal conditioning and embryo treatments at the hatched blastula stage (17 hpf). The differences between these treatments were largely driven by embryo size (Figure 8B). More specifically, it appears that embryos from females conditioned inside the kelp forest were not significantly different in size, regardless of their exposure to pCO2 during culturing. However, hatched blastula embryos from females conditioned outside of the kelp forest exhibited a significantly different size in response to pCO2 conditions, with those raised at higher pCO2 conditions exhibiting an 8% larger area, on average, in comparison to those raised in the lower pCO2 treatment. Previous research has shown that early stage purple urchins are impacted by pH and oxygen change. However, the vast majority of this research has been conducted in the laboratory, and usually only examined the effects of high pCO2/low pH using static treatment conditions. Additionally, many have focused on the impact of pCO2 treatments on the energetic costs of skeletogenesis, finding that the larvae under high pCO2 expend more energy (Stumpp et al., 2011) to create shorter spicules (Yu et al., 2011). Here, we review studies that investigated the energetic demands of earlier stages of S. purpuratus, specifically in a transgenerational context. Prior research in our lab has examined TGP in purple urchins; these lab experiments were the motivation for the field component of this work. In the lab studies, we found evidence that the maternal environment affected gametogenesis. In one study, we found that adult female S. purpuratus held at static upwelling conditions in the laboratory (1,100 μatm pCO2, 14°C) during gametogenesis had non-significantly 3.2% larger eggs than those from mothers raised in ambient conditions for the region (400 μatm, 17°C), with progeny sizes continuing to reflect this maternal effect (Wong et al., 2018). While the urchins conditioned outside of the kelp forest had both a lower temperature and higher extrapolated pCO2 (derived from the known relationship between DO and pH at the region), the differences in absolute means of both pH and temperature between the field sites in this study were not as pronounced as those from Wong et al. (2018). Subsequently, the results presented here do not show a pronounced difference in egg size between maternal conditioning treatments. In an additional study, we found that embryos from mothers acclimated to static upwelling conditions (1,150 μatm pCO2, 13°C) were larger than the embryos from mothers acclimated to non-upwelling static conditions (500 μatm pCO2, 17°C) (Wong et al., Unpublished). Overall, both studies show a clear effect of the maternal environment on gametogenesis. Regardless, not only can maternal effect change offspring characteristics, but it can also change the tolerance of offspring to environmental variability of pCO2. In other studies, S. purpuratus has been shown to not alter its biochemical makeup in the face of experimental ocean acidification (Matson et al., 2012; Pan et al., 2015). However, it is becoming increasingly clear that studies that involve early developmental stages must take into account the genotype or the husbandry conditions of the adults, as both of these factors may play a major role in the biological response. A suite of studies on fluctuating pH often find that changing the variance of pH can affect organism more than altering the mean. Fluctuating scenarios can vary on the species level, with even congenerics responding similarly to static conditions. This may be particularly important for benthic sessile organisms, that are dependent on the environment on which they settle. In contrast, any difference seen between these sites less than 100 m away can be traversed by most mobile organisms. If there is indeed a variation in preference for pH/DO regimes between species, then a heterogenous environment may provide a large opportunity for organisms to move to their regime of preference. Individual species must be more extensively surveyed in a multistressor framework to understand the vulnerability of coastal oceans to these ocean conditions (Gobler and Baumann, 2016). 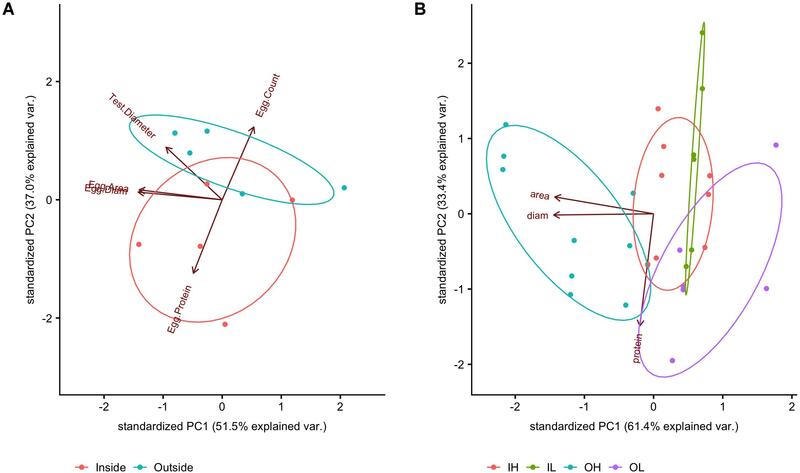 Overall, experiments that study the effect of pH variation on organisms generally show disparate results that do not form conclusive trends across taxa, and do not take into account the ability of the organism to move out of a stressful environment (Alenius and Munguia, 2012; Roleda et al., 2012; Kim et al., 2013; Frieder et al., 2014; Clark and Gobler, 2016; Davidson et al., 2016; Eriander et al., 2016; Keppel et al., 2016), with many of these studies utilizing pH and oxygen variability that generally reflect what is observed in this MKO kelp forest system. A more thorough understanding of both species physiology and community interactions will be critical in understanding the true prospect of kelp as a biomediator of global abiotic stressors. Ultimately, this field experiment detected a within-generation plasticity (WGP) effect in response to development under high pCO2. Note however, that this response was mediated by transgenerational effects – in other words, the differential growth patterns of the embryos was based on the environmental experience of the mother. The concept that TGP can be a result of climate variability has been posited by Donelson et al. (2018). Here, the authors noted that TGP may be more advantageous in spatiotemporally stable regions where offspring can utilize parental cues. On the other hand, sea urchins in the CCLME are exposed to physiochemical conditions that can change over much shorter distances and time scales than larval dispersal. This makes the advantage of TGP less intuitive for this organism and its environment. In this case, the WGP of body size in response to pCO2 conditions may be explained as the result of the unpredictability of the maternal environment priming the larvae to be able to phenotypically respond to a large suite of conditions. This is supported by observations made by Wong et al. 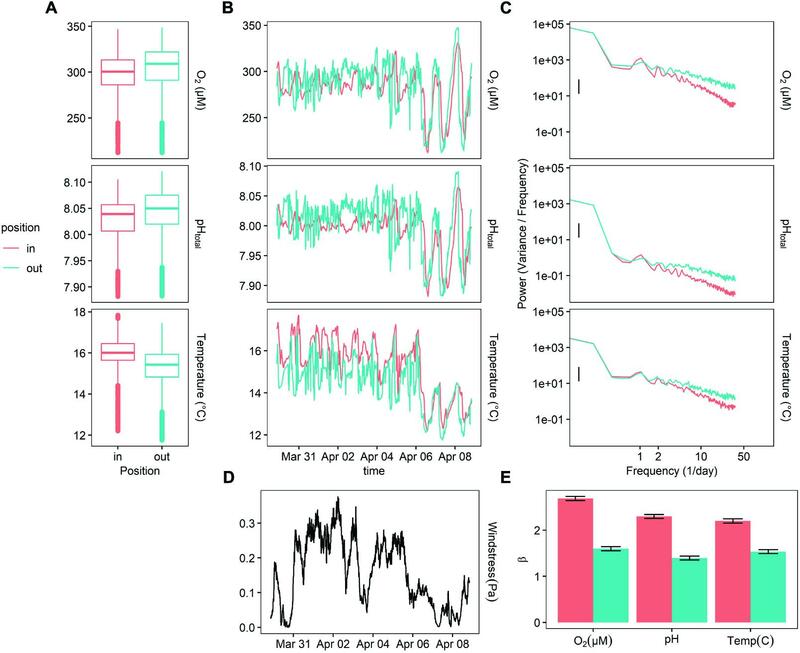 (2018) where the transcriptome changed in a manner that also suggests that female conditioning can prime the progeny to better respond to extreme abiotic conditions during development. Understanding the role of TGP in nature and the mechanisms that drive such a response are of great interest to the marine science research community at the moment (Ghalambor et al., 2007; Hofmann, 2017; Donelson et al., 2018), and this is one of very few studies that are designed to investigate this in situ (Murray et al., 2014). While there is emerging evidence that the degree of pH fluctuation can modify the outcome of simulated ocean acidification experiments in laboratory-based mesocosms (Frieder et al., 2014; Roleda et al., 2015), it is unclear whether this difference in the frequency of variation will alter organismal response in nature. However, some field studies have begun to explore the ecological and biological consequences of pH variability for natural populations. In a study from Murray et al. (2014), early stage silverside fish (Menidia menidia) displayed different tolerances that correlated to the conditions the females experienced in the tidal marsh during the reproductive cycle. In a second study, Britton et al. (2016) found that a species of brown algae, Ecklonia radiata, was physiologically adapted to the diurnal pH/DIC conditions of its environment, and performed less optimally at either of the static pH treatments (pH 8.4 and pH 7.8) corresponding to the extremes of this diurnal variation. However, given that the response to diurnal pH variation was different across different algae (Roleda et al., 2015), or even congeneric invertebrates (Frieder et al., 2014), it is unclear how covarying pH and DO could influence TGP in S. purpuratus. Overall, investigating the molecular basis for this plasticity over a multigenerational manipulation may be the key to ultimately understanding this variation in response (Foo and Byrne, 2016). Regardless, any phenotypic plasticity may play a critical component in the survival of marine species to rapid global change (Munday et al., 2013). The datasets generated for this study, as well as the code for analysis, is available at the following doi: 10.17605/OSF.IO/A8N3P. UH and GH conceived and designed the experiments and wrote the manuscript. UH, along with assistance from SBC LTER staff, performed field and lab work. UH performed the statistical analysis. Both authors have read and approved the submitted version. This work was partially supported by awards to GH: the UC Climate Champion award from the University of California, and a grant from the United States National Science Foundation (NSF) (Award IOS-1656262). In addition, support for boating and sensor deployment and partial stipend support was provided by the Santa Barbara Coastal Long Term Ecological Research program (NSF award OCE-1232779; Director: Dr. Daniel Reed). In addition, UH was supported by an NSF Graduate Research Fellowship (NSF-1650144). We thank Dr. Robert Miller, Prof. Libe Washburn, Prof. Kathy Foltz, and Prof. Erika Eliason for input on the experiments. We thank Clint Nelson for help during field deployments and support of the diving required to support the project. We also thank Dr. Marie Strader, Juliet Wong, Terence Leach, Logan Kozal, and Maddie Housh for assistance with urchin spawning and raising cultures of embryos. Dickson, A. G., Sabine, C. L., and Christian, J. R. (2007). Guide to best practices for ocean CO2 measurements. PICES Spec. Publ. 3:199. Gattuso, J.-P., Epitalon, J.-M., Lavigne, H., and Orr, J. (2017). Seacarb: Seawawter Carbonate Chemistry. Available at: https://CRAN.R-project.org/package=seacarb. Nielsen, K. J., Stachowicz, J. J., Boyer, K., Bracken, M., Chan, F., Chavez, F., et al. (2018). Emerging Understanding of the Potential Role of Seagrass and Kelp as An Ocean Acidification Management Tool in California. Oakland, CA: California Ocean Science Trust. RStudio Team (2017). RStudio: Integrated Develpment for R. Boston, MA: RStudio, Inc.
Smith, S. R. (2016). Seagrasses as Potential Chemical Refugia for Acidification-Sensitive Bivalves. Corvallis, OR: The Valley Library. Strathmann, M. F. (1987). Reproduction and Development of Marine Invertebrates of the Northern Pacific Coast. Seattle: University of Washington Press. Copyright © 2019 Hoshijima and Hofmann. This is an open-access article distributed under the terms of the Creative Commons Attribution License (CC BY). The use, distribution or reproduction in other forums is permitted, provided the original author(s) and the copyright owner(s) are credited and that the original publication in this journal is cited, in accordance with accepted academic practice. No use, distribution or reproduction is permitted which does not comply with these terms.